When we think of the Great Depression of the 1930's, we usually think of the millions of unemployed workers who travelled across the country looking for work, knowing there was none. We may think of the federal work projects like the Civilian Conservation Corps (CCC) with its work in state and national parks or the Works Progress Administration (WPA), which provided work constructing roads and buildings. We do not tend to think of federally funded art projects as a part of the government back-to-work movement In fact, the federal government funded four art projects. Much of the work has been destroyed, but efforts are being made to restore work that has been hidden by grime and paint or behind new construction. Walter Christopher Elementary School in Chicago. Courtesy of the Chicago Conservation Center. Although President Herbert Hoover made some efforts to meet the needs of the unemployed, his work helped very few people. It was not until Franklin Delano Roosevelt became president that the federal government instituted programs to put the unemployed to work. George Biddle, one of Roosevelt's classmates at Groton and Harvard, felt very strongly that artists needed work just as much as anyone else. He presented the idea to Roosevelt, not only as a back-to-work project, but also as a project that would encourage discouraged people. Art would be placed where people who had little chance to visit museums and galleries would see it. The first project, the Public Works Art Project (PWAP), was funded from November 1933 to June 1934 as a part of the Civil Works Administration under the auspices of the Treasury Department. Edward Bruce served as director. With little time to develop guidelines concerning an artist's qualifications, regional directors were appointed and had to develop their own guidelines. People with limited artistic ability were often given work, resulting in much poor quality art. 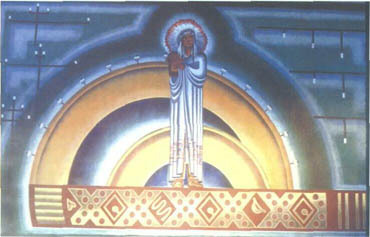 of one of Siporin's murals. Courtesy of the Decatur Herald & Review. building. When he checked, he found the murals, which were cleaned, restored, and placed in the Instructional Media Center. The second project, the Treasury Department Section of Painting and Sculpture, later the Section of Fine Arts, was established in 1934 and was to have been a permanent project, but it ended in 1943 because of America's involvement in World War II. The Section worked with the Public Building Service, also under the Treasury Department, to put art, both paintings and sculpture, in federal buildings constructed during the Depression. The Section was not funded directly by the federal government. Instead, an agreement with the Public Building Service gave it approximately one percent of the funds appropriated for new federal buildings. Most of the Section work is in post offices and can be found in towns and cities of all sizes in all of the forty-eight states of the time. Alaska, Hawaii, and Puerto Rico were each awarded one project. The number of commissions awarded to each state depended in large part on the size of the state which determined, at least in part, the need for new federal buildings. Hence, New York and Illinois received large numbers of art work, while Wisconsin and Montana received very few. Courtesy U.S. National Archives, College Park, MD. Many federal buildings, primarily post offices, were built in Illinois during the Depression and were awarded art projects. Edward B. Rowan, the director of the Section, was less concerned about putting unemployed artists to work than in the quality of the work the artists produced. The Section held competitions for major works. If no work was accepted following a regional competition, artists who had completed work elsewhere were asked to submit sketches. Artists who were not selected for a major building might be assigned to a smaller one. The Decatur Post Office is a case in point. When the competition was held, no satisfactory work was found, either by the regional committee or by the federal officials. Edgar Britton and Edward Millman, who had worked extensively for the PWAP and WPA, were invited to submit sketches. Mitchell Siporin was asked to join them, while Raymond Breinin, who had submitted a sketch, was given a commission for the Wilmette Post Office. The money that the artists received was expected to cover all expenses including travel and materials. Many federal buildings, primarily post offices, were built in Illinois during the Depression and were awarded art projects. Illinois is fortunate that the art in seventy of these buildings still exists and is still available for viewing. Most of the WPA art was done in large cities, so, places like Champaign and Carbondale were fortunate to receive art awards. The Decatur Post Office has by far the most art, which includes true frescoes, of any post office in Illinois. The Oak Park Post Office is an outstanding building, but the art is limited, probably due to the design of the building. The Evanston Post Office has four sculptures - two limestone ones on the exterior and two aluminum ones covered with gold foil inside. Smaller towns, such as Eldorado, Chester, Mt. Morris, and Gillespie, were awarded art projects, as well. shows a detail of the Frances Perkins panel. 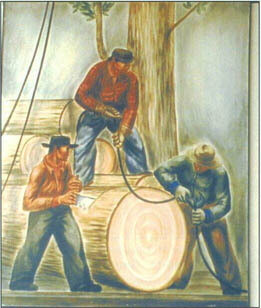 WPA established and directed the third project, the Federal Art Project (FAP), in 1935. It also ended in 1943, even though much of the Project's activity at the time was directed toward art for the war effort. Most of the art works funded by the federal government were completed through this project and included easel work, murals, sculpture, and graphics. 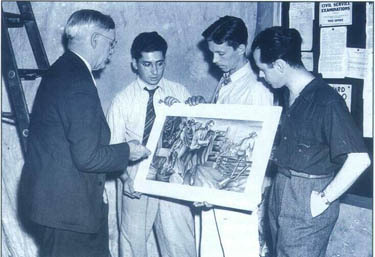 Under this program, murals were painted in many public buildings. Schools were among the public buildings that were recipients of murals and sculpture. Both Lane Technical High School and Flower Vocational High School in Chicago, Chicago City Hall, Champaign Junior High School, and Southern Illinois University in Carbondale were awarded art projects. Most of the WPA art was done in large cities; so, places like Champaign and Carbondale were fortunate to receive art awards. Funding was provided for music, drama, and literature. Because the visual art component was the largest and WPA is so commonly known, most references to Depression Era art are directed toward the WPA. Lane Technical High School in Chicago has a great deal of art, including murals and both wood and stone sculptures, which were done by several artists. Edgar Britton, Mitchell Siporin, Peterpaul Ott, and Charles Umlauf, who also worked for the Section, are four of the better known artists. Edgar Britton's seven panels, Epochs in the History of Man, grace the cafeteria. Mitchell Siporin painted four panels, The Teaching of Art, for the foyer of the auditorium. Peterpaul Ott supervised the carving of six mahogany panels titled Evolution of the Book and five panels titled Control of the Elements. Charles Umlauf's sculptures are located in the courtyard. The murals at Chicago's Flower Vocational High School were painted by Edward Millman and have been restored recently. These murals are unusual because they depict important women in history. In most cases, women are either not shown or are pictured as having a relatively insignificant role, especially if the artist was a man. However, Flower Vocational was a high school for girls at the time the work was done. At one time, the mural in Chicago City Hall, also by Millman, was hidden behind a wall. When the building was later remodeled, the mural was rediscovered. It has since been cleaned and restored. Leigh Block Art Gallery at Northwestern University in Evanston. The Treasury Department directed and WPA financed the fourth project, the Treasury Relief Art Project (TRAP). The work done through this project was somewhat limited, but works included easel paintings, murals for existing buildings, and sculpture. Archibald Motley, Jr., one of the few African-American artists given work, was an easel painter under the Project. He later painted the mural for the Wood River Post Office. Women were frequently given commissions. In the West, Native Americans were often selected to do art related to their culture, but few African-Americans were considered for any of the projects. In Illinois, much of TRAP'S work created statues for the Jane Addams Housing Development in Chicago. The history or whereabouts of the sculpture is unknown. Most of the art was oil on canvas, so that even murals were usually done in a studio and transported to the site by the artist for installation. All of the federal projects tended to focus on the American scene as the subject for the art work. The Section, in particular, required the artists to visit the community for which they were producing art to talk to people about the subject of their work. Regionalism was the central theme of the piece of art. For example, Fay Davis' Loading the Packet is in Chester on the Mississippi River. John Winters' Lincoln in New Salem, Illinois, is in nearby Petersburg, and Fay Davis' The Illini and Potawatomies Struggle at Starved Rock at Oglesby depicts the history of the area. The exceptions in Illinois are the sculptures in Chicago's Kedzie Grace Branch and Logan Square Branch post offices and the Morton Post Office, which feature gods from the Old World. Many Illinois post offices feature early pioneers, mail service, farming, and industry. Park High School. Courtesy of the Author. Most of the art was oil on canvas, so that even murals were usually done in a studio and transported to the site by the artist for installation. The Pittsfield Post Office has copies of William Schwartz's letters stating the date of his first visit and the date he would return with the finished mural. Rainey Bennett stated that he had to travel elsewhere; so, his Hart Fellows: Builder of Rushville mural was taken to Rushville and installed by someone else. Tempera paintings were also done in the studio, as were the relatively few sculptures, which ranged from wood to terra cotta and poured stone reliefs. Zoltan Sepeshy's Barnyard in Nashville is tempera on wallboard. In addition to supervising the carving of panels for Lane Technical High School, Peterpaul Ott carved wood reliefs for the Kankakee and Plano post offices. Newell Hillis Arnold's Post Rider is a terra cotta relief of a bird's eye view of a post rider being attacked by Indians that was done for the Abingdon Post Office. by Dorothea Mierisch. Courtesy U.S. National Archives, College Park, MD. school students spent their noon hours at the Post Office watching the artists and talking to them about their work. One such spectator, Kay Rufus of Decatur, recently expressed her awe at how easily Mitchell Siporin painted his murals while standing on a board. PWAP, FAP, and TRAP each sponsored the creation of other types of art on a smaller scale. Sometimes, community members did not like the art that was created for them. The postmaster at Rock Falls reported that Curt Drewes' sculptures, Farming by Hand and Manufacture of Farm Implements, were not well-received because they could have been placed in any post office in the Midwest. The citizens of Rock Falls wanted something that related to Rock Falls only, but they did accept it. 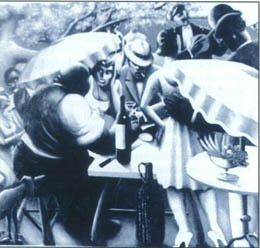 Wendell Jones' mural, Sandbagging the Bulkheads, was rejected by the leaders of Cairo. Most of the citizens in Cairo were of Southern descent. The mural was not genteel enough for their Southern sentiments and did not show any influential members of the community. It showed sandbagging along the Ohio River that saved Cairo from the flood that devastated much of the area along the River. 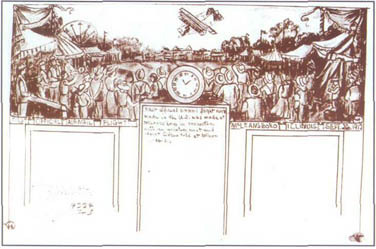 The mural was one of several selected to be sent on a tour of South America and was lost. The National Archives at College Park, Maryland, has records for most of the murals, but Wendell Jones' work is not among them. Likewise, Boris Gilbertson produced a walnut bas-relief for the Macomb Post Office that was to be installed in 1943. However, public sentiment opposed the art work. The sentiment expressed at that time was that money should not be wasted on art but should be directed toward World War II. Instead of being placed in the post office, it was given to the Smithsonian Institution, and it is now part of the collection at the National Gallery of Art in Washington, D.C. 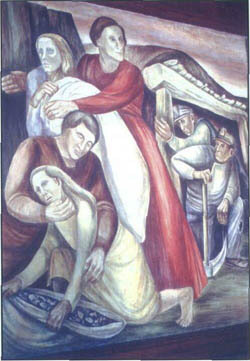 Contact with two artists indicates the value of the work during the Great Depression. A telephone conversation with Rainey Rennett, who painted murals for the Naperville and Rushville post offices and supervised much of the art at the University of Illinois Medical Center in Chicago, brought this comment, "It was great. It saved my life. I could paint and make a living for my family." The Chicago Conservation Center is a resource facility for the conservation of fine art. The firm specializes in the conservation of paintings, murals, works of art on paper, frames, textiles, and sculpture. The mural department has successfully restored over three hundred murals throughout America and is presently under a four-year contract with the City of Chicago to conserve WPA and pre-WPA murals in the city school system. Photographic examples of the CCC's mural conservation projects in Chicago accompany this article and appear with the Centers kind permission. The Center was established in 1983 by Barry Bauman. Mr. Bauman was the former Associate Conservator of Painting at the Art Institute of Chicago and served the museum for eleven years. He is an elected fellow of the American Institute for Conservation. Native American Theme by artist John Walley was completed in 1936 for Chicago's Lane Technical High School. for appraisal. I did three murals in post offices in Pennsylvania, one in Amber, one in Sellersville and the one you see in Lakeview [Branch in Chicago], entitled (sic) Chicago — The Epoch of a Great City. It was an important period in the history of American art. It was the first time that walls were made available and that we were paid to paint on them. Heaven!!!" Much of the art has been destroyed or covered by people who did not consider its historical significance. When the Melrose Park Post Office was razed, the fresco was lost. The mural in the Herrin Post Office disappeared when the post office was remodeled. Relocated, many people have come to consider it quite valuable, and efforts are being made to restore and protect it. The Chicago Conservation Center has been actively involved in restoring murals and other art in the Chicago area and has worked in Lane Technical High School, Flower Vocational High School, and many other buildings. Museums and art galleries are exhibiting collections of Depression era art. More people are recognizing the value of the art, which depicts much of our history and is a part of our history related to the Great Depression. Goldston, Robert. The Great Depression: The United States in the Thirties. Indianapolis: The Bobbs Merrill Company, Inc., 1968. Marling, Karal Ann. Wall to Wall America: A Cultural History of Post-Office Murals in the Great Depression. Minneapolis: University of Minnesota Press, 1982. Mavigliano, George, and Richard A. Lawson. The Federal Art Project in Illinois. Carbondale: Southern Illinois University Press, 1990. O'Connor, Francis V. Art for the Millions. Greenwich, CT: New York Graphic Society, Ltd., 1973. Thompson, Mary Emma. A Guide to Depression Art in Illinois Post Offices. Westfield, IL: The Author, 1995.